In the single deadliest day in Israel and Palestine since the Israeli assault on Gaza during the summer of 2014, 55 Palestinian demonstrators (and counting) were killed and more than 2,700 wounded by the Israeli military in Gaza on Monday. The Palestinian demonstrators had gathered at the border with Israel for two purposes: to mark the 70th anniversary of the Nakba—the expulsion and flight of hundreds of thousands of Palestinians from their homes in 1948— and to condemn the opening of the new American embassy in Jerusalem, a controversial decision that flouts decades of US policy in the region. As Gazan protesters were met with live fire, a mix of Christian Zionists, Trump administration officials, and pro-Israel zealots attended the embassy ribbon-cutting in Jerusalem. Chuck Schumer, the top Senate Democrat, signaled his support for the embassy opening from the US. “I sponsored legislation to do this two decades ago, and I applaud President Trump for doing it,” he told journalists. 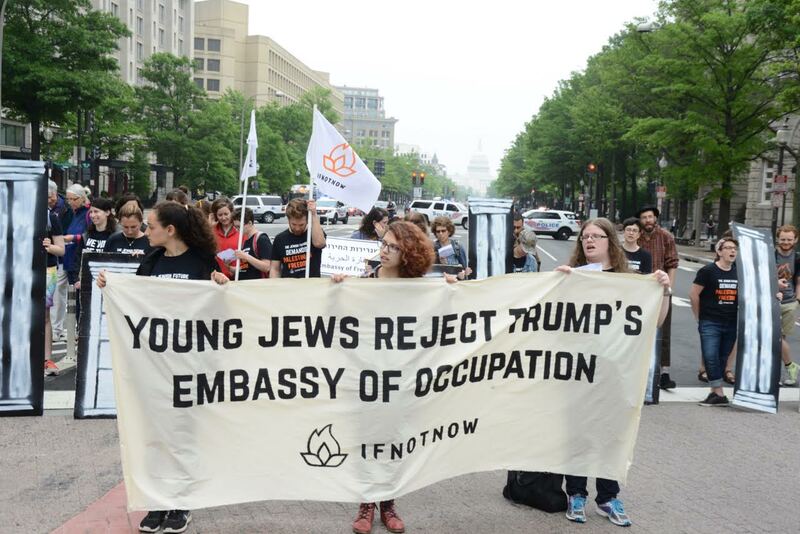 In Washington DC, meanwhile, activists with IfNotNow, a group of young American Jews opposed to the Israeli blockade of Gaza and occupation of the West Bank, took to the streets. IfNotNow activists livestreamed their protest on social media. They expressed anger with both the death toll that rose throughout the day and the opening of what they called the “embassy of occupation” in Jerusalem. The group, led by rabbinical students and rabbis in the movement, carried signs, shouted slogans and held a banner reading “The Jewish Future Demands Palestinian Freedom,” and called for American Jewish and political leaders to press for an end to Israeli military action. “Our question is, ‘Which side are you on?’” IfNotNow organizer Yonah Lieberman explained to Reuters about the protest in an interview. You can watch the IfNotNow protest here.